Bees are an essential part of the food system – it is said they are responsible for over 80% of the worlds pollination. Over the last decade there has been a drastic reduction in bees. The deaths are commonly blamed on Colony Collapse Disorder – but the cause of this die off is debated. Common culprits blamed for this are global warming , air pollution, habitat destruction, GMO crops and pesticide use. There is data to support each of these possibilities however, they are probably all partially responsible. Recently there has been increased research pointing to certain pesticide and herbicide sprays being the main culprit. Whatever the cause, one thing is certain – the loss of bees, the worlds best pollinators is a real risk to the future survival of humankind. Urban beekeepers play a an important and vital role in helping ensure the future of bees while adding valuable pollination services to neighbouring gardens. Urban gardeners in turn play a valuable service to the bees by providing a rich and diverse section of plants to harvest. Perhaps part of the reason urban environments are great for the bees is because many municipalities across the country have pesticide spray bans which lead to a healthier environment for the bees to work. Urban areas also tend to have more consistent temperatures and because of the heat island effect, hives have a greater chance of overwintering if properly winterized. Urban gardeners also tend not to plant GMO crops and tend to their land in a more organic holistic way. 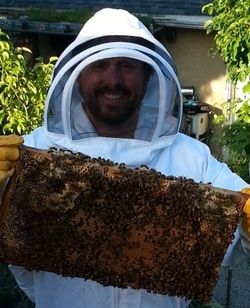 The hobby of beekeeping is very rewarding but it isn't for everyone. I would highly recommend taking a beekeeping course before starting the hobby. Firstly and at a minimum you get a chance to handle real bees. If this isn't part of the course it isn't worth it! Secondly you get a chance to learn more about the commitment required and the complexities of maintaining a hive. Don't get me wrong – raising bees is and amazing experience but it isn't as relaxing and simple as raising chickens. Some of the many joys of beekeeping are watching the bees fly in and out of the hive, some loaded with pollen and watching them dance for each other as a way to communicate and give directions to their fellow workers as to where they can find flowers loaded with pollen. Watching the social interactions between works, drones and the Queen bee is quite an educational experience. The buzz of the bees and the sweet smell of the honey when you enter the hive is mesmerizing. If your interested in raising bees it is definitely worth thinking about, there are some great websites to check out to help you learn more about honey bees and see if they are a fit your your family!